Help! My Neon Tetra's Colors Are Fading. Help! My Neon Tetra’s Colors Are Fading. Dull colors could mean stress or disease. Here’s how you can help prevent it. If you have an aquarium at home, it’s likely that you’ve filled it with neon tetras. Neon tetras are some of the most recognizable fish out there, and are found in almost all pet stores that sell fish due to their popularity and their beautiful coloring. Neons add a bold splash of color to your aquarium, but sometimes those vivid blues, greens and reds start to dull. Naturally, we fish lovers find this a bit alarming. If your neon tetra’s colors are fading, you may want to start looking into why. Neon tetras like to be part of a group. These fish stick to schools rather than swimming solo — being alone will stress them out. “Like other mid-water fish, the neon tetra should be kept in a school of 6 or more individuals,” advise Carlo Devito and Gregory Skomal in The Everything Tropical Fish Book. When the solo neon gets stressed, his colors will start to fade, so bring home enough neon tetras to form a school. This will help your fish transition to their new home and your tank will look even more beautiful. It’s a win-win. Although neon tetras are hardy fish — they can live up to 10 years — transitioning them to a new tank can be tricky. You must have the right water chemistry for your neon tetras to thrive. The pH of your tank should be between 6.0 and 6.5, and your aquarium should be properly cycled before you add any fish. Cycling your aquarium serves to remove harmful chemicals. Although fish excrete ammonia, ammonia is actually toxic to fish. So cycling an aquarium will help convert toxic ammonia and nitrites to non-toxic nitrates. Need more of a breakdown? Fish produce ammonia in their waste, and there’s a type of bacteria in your filter that converts that ammonia to nitrites, which are even more toxic to fish. Then, another bacterium in the filter takes those harmful nitrites and converts them to non-toxic nitrates. But your neon tetras need this process already in the works before you introduce them to the water. Purchase a test kit to test your aquarium water weekly. Your nitrites and ammonia should both test at 0ppm before you add any tetras to the tank. Otherwise, you’ll quickly see your neons’ colors dulling — and they could even die. The neon tetra originated in South America and is used to a shady environment with lots of plants for cover. A brightly lit tank with very few plantings may stress your neon tetras out — another reason their colors will pale. A good tank is softly lit and has plenty of plants for your tetras to retreat to. “This species does not do well under bright lighting, so make sure to subdue the atmosphere as much as possible,” advise Maddy and Mic Hargrove in Freshwater Aquariums for Dummies. 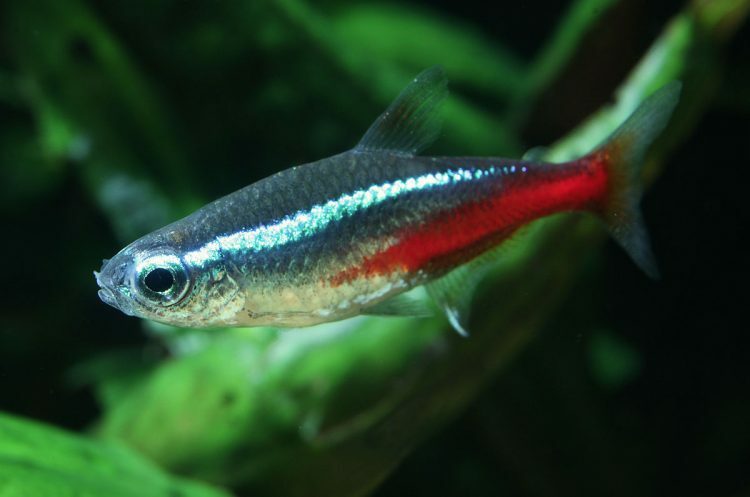 Neon tetras may also exhibit a slight color fade when they spend a lot of time in darkness or at night. This color fade is normal and not usually cause for alarm. 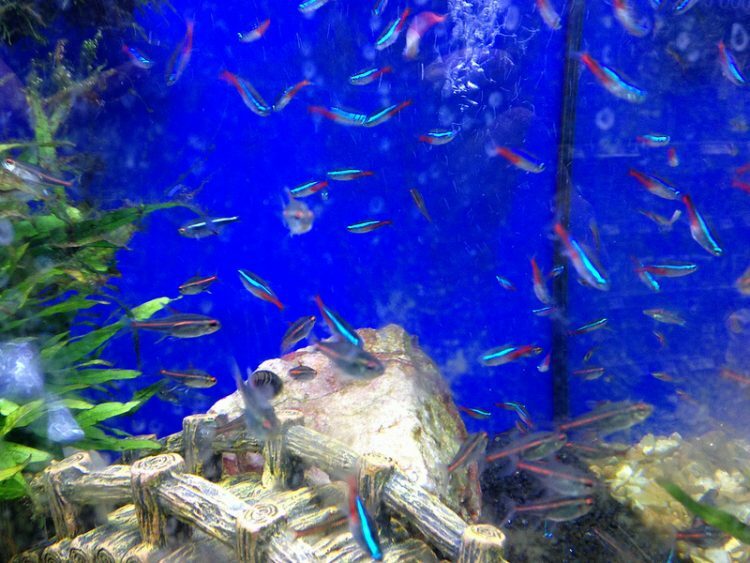 Unfortunately, neon tetras do get sick, and there is even a “neon tetra disease” that has no remedy. “Pleistophora Hyphessobryconis (sometimes also spelled Plistophora), which is responsible for the well-known ‘neon tetra disease,’ is perhaps the best known sporozoan disease in tropical fish, most notably in neon tetras…. The disease is said to spread when infected fish or detritus containing the spores are consumed,” says Brian Andrews in Ornamental Fish Farming: Fish Diseases and Health Management. Your fish have more of a fighting chance against disease if you keep their tank clean and well tended. With neon tetra disease, you won’t know your fish are infected until they become symptomatic — by that time, the rest of your tank could be infected. If your neon tetras contract neon tetra disease, quarantine the affected fish immediately to protect the others. Also, contact the place in which you purchased your fish to let the owners know as well, just in case your fish were infected there. Neon tetras’ colors can dull for a lot of reasons and it can be a startling thing to witness. It certainly doesn’t indicate that your fish is on his deathbed, but it’s important to try and discover the cause so you can get those colors rightly bright again. So keep a clean and well-cycled tank, sit back and admire your beautiful neons.